An odd release here by the noise band Kaspar von Urbach. Two pieces, one lasting just five minutes and one forty-eight. The latter begins with the voice of Burroughs, quoting Gysin about 'literature being fifty years behind painting', and somewhere in the piece we hear McLuhan's 'the medium is the massage' as a loop. All set to a sound collage of sorts. 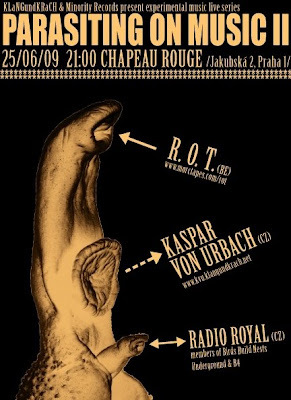 There are noise bits of them rambling on some sheets of metal, electronic (guitar pedals), but what makes this release more interesting than the usual noise bunch, is the fact that Kaspar von Urach knows how to pull back. They build in moments of relative silence, although not as 'microsound' as some of the bits on 'Selfbondage' (see Vital Weekly 656), which was throughout a better release. That one was a mixture of styles (ambient, microsound, folk noir, noise) and I was wondering which style they would pick to explore. It was noise in the end and while they don't do a bad job, this release didn't please me that much. Maybe a solid mixture of noise and say microsound would be a thing for them. The ideas are there, just needs shaping. Behind Birds Build Nests Underground we find Michal Brunclik and Petr Ferenc, who are armed with a bunch turntables, vinyl records and loops create their work 'Cold Dreams'. It takes a while before I realized that they use vinyl only, which was nice, but somewhere around the ten minute mark things dawned on me. That's not bad, since I must admit I am not the biggest lover of works like this. Even when I like the music itself, I keep thinking: well, this is made with sounds other people have produced in the first place. I think Birds Build Nests Underground do a nice job, sometimes it stays a bit too long in a loop, and some of the fades are a bit crude, but its nice enough though. More the kind of stuff you should witness in an intimate setting in a small concert space, rather than play at home, I think. Which makes me wonder why people actually release music like this. 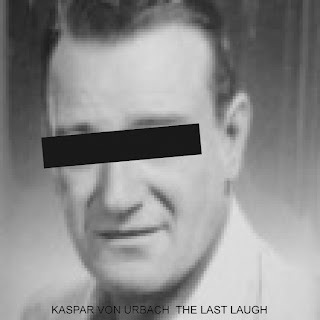 Nový titul: Kaspar von Urbach "The Last Laugh"